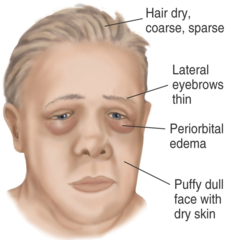 Myxedema may present with pale skin, periorbital edema, goiter and symptoms of hypothyroidism. Myxedema occur due to hypothyroidism in adulthood. It mostly affect middle age women. The common causes of myxedema in adulthood is due to radiotherapy,deficiency of the iodine and destruction of the thyroid gland. Myxedema my present with retention of the hyaluronic acid and glycosaminoglycans. There will be moderate enlargement of the thyroid gland. Patient with myxedema is suggested to be treated with synthetic levothyroxine.